Custom designed printed circuit board for the Asporto // Heart Preservation Device. 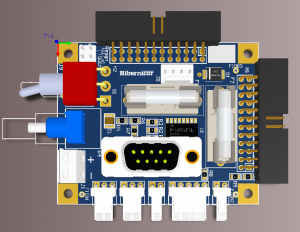 Hibernicor has developed a new micro-controller interface circuit board to smaller package. Specifically this printed circuit board adds important features of temperature monitoring with a thermistor, robust componentry, and lightweight surface mounted resistors. The circuit board uses custom designed schematics and design validated for quality manufacturing to further improve the safety and reliability of the Asporto // Heart Preservation Device. Hibernicor is committed to continuously improving product quality, reliability to deliver innovative, safe and effective medical device technology for heart transplantation.